(TibetanReview.net, Jan24, 2015) – The People’s Congress of Tibet, the local-level rubberstamp lawmaking body of Tibet Autonomous Region, ended its annual session Jan 23 with the passing of a law on sky burial, the Tibetan tradition of disposing of the dead by feeding it to vultures, reported China’s official Xinhua news agency. The report said the law was necessitated by controversy which arose after guides began leading tour groups to view the ceremony. The region actually already had a provisional rule banning sightseeing, photographing and video recording at such burial sites, or publishing reports and pictures describing the rituals. But apparently this rule adopted by the regional government in 2005 was never enforced effectively and it remains unclear whether the new law will make much difference. In China, the problem is often not the absence of laws but the failure to implement them because the party determines and interprets the laws as they see fit, including by ignoring them entirely. 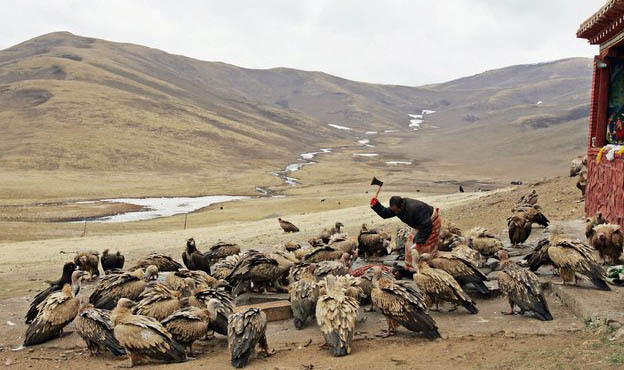 The report added that the law will address complaints that some travel agents have shown disrespect to the tradition by organizing tours to sky burial sites. It was not clear why such complaints could not be addressed under the 2005 provisional rule.